Billed as ‘a composition for five pianos with no pianists, a performance without performers, a play with nobody acting’, Artangel’s recent staging of Heiner Goebbels’s Stifter’s Dinge (4–18 November 2012) in the concrete bunker of Ambika P3, a former concrete construction hall in central London, took two forms: a seated performance (a repeat of the work’s initial London presentation in the same space in 2008) and a new version of the performance titled The Unguided Tour. Lasting for the duration of the gallery’s opening hours on any given day, when the space was to be entered and left at will, in this adaptation visitors were invited to walk freely around a complex mechanical rig of moving platforms, pianos, speakers, lights and screens – part car-wash, part stage set – within which highly choreographed sequences of recorded and live sound, projections and lighting unfolded. The main body of the rig comprised three low pools, separated at times by screens that periodically descended from the ceiling. Beyond these pools, and advancing on rails, were three moving platforms housing pianos in various states of disassembly; these were either programmed player-pianos or strummed by mechanical arms that scraped across their exposed strings. The moving platforms housed, alongside the tightly encased pianos, a variety of pipes and fans rigged up to whir or hum as part of this mechanised musical ensemble. A small number of satellite machines or devices mounted on the walls of the space contributed another similarly industrial layer to the sound. The amplification of these sounds, played back through speakers, had the effect of flattening them, and depriving them somewhat of their interaction with the spatial acoustics of the surroundings. In appearance, the machinery and devices (particularly within the walls of Ambika P3) veered towards steampunk – a genre of science fiction characterised by a stylised use of elaborate anachronistic technologies and retro-futuristic inventions – in the levered metal arms that strummed piano strings, the fans sounding along chimney-like tubing or a small screen that was lowered into the performance space on a long bicycle chain. Heiner Goebbels, Stifter's Dinge: The Unguided Tour, 2012, mixed media installation. Installation view, Ambika P3, London, 2012. Photograph: Ewa Herzog. Courtesy the artist and Artangel It is in this all-pervasive mechanisation, primarily, that a problem arises, or rather in the prominence of mechanisation when viewed in relation to the ideas and landscapes that the production attempts to evoke. In its own terms, this production – be it guided or unguided – takes as its source the writings of Adalbert Stifter, the nineteenth-century Austrian writer, poet, painter and educator. In her essay ‘Great Friend of Reality’, Hannah Arendt described Stifter as ‘the greatest landscape-painter in literature’, and his writings, relatively unknown in English translation, are characterised by minutely detailed observations of the natural world.1 While it is made clear in the programme notes that Stifter’s Dinge does not attempt to portray the scenes and landscapes of Stifter’s novels and poems, it does claim to take from them a sense of a confrontation with the unknown, the sublime, or with forces that man cannot master. And yet what we see and hear in the course of the production is pure and consistent mechanical mastery, that runs along rails and chains to its conclusion. Every sound or movement, each action that constitutes this “performative installation” ... is held in the vice-like grip of the mechanics that attempt to animate it. While it is made clear in the programme notes that Stifter’s Dinge does not attempt to portray the scenes and landscapes of Stifter’s novels and poems, it does claim to take from them a sense of a confrontation with the unknown, the sublime, or with forces that man cannot master. And yet what we see and hear in the course of the production is pure and consistent mechanical mastery, that runs along rails and chains to its conclusion. Every sound or movement, each action that constitutes this ‘performative installation’ (as it is referred to by Goebbels), is held in the vice-like grip of the mechanics that attempt to animate it. The mechanics come first, and it is this foregrounding of the apparatus that gives a restrictive opacity to the lens through which we encounter what is animated. Pay no attention to that man behind the curtain. Other voices are heard (extracts from interviews with Claude Lévi-Strauss and Malcom X, an extract from William S. Burroughs’s Nova Express  as well as ethnographic field recordings from Papua New Guinea, Greece and Colombia) and paintings by Paolo Ucello and Jacob Isaacksz van Ruisdael are projected on to the pooled water on the floor, or on to screens that lower from the ceiling. But it is at this moment only, in the narration of ‘The Ice Tale’, that a sense of space, of a wider sonic landscape fleetingly appears, in which one’s thoughts can momentarily shift beyond the railed certainty of the theatrical production line, and into a more expansive space where one’s imagination is allowed some agency. However, the moment of expansion that might be found in contemplating the distant sounds of falling ice, is a limited counterbalance to the overly literal dressing of the scene. For instance, bare tree branches are mounted on the platforms on which the pianos sit, and along which they at times advance or recede while being strummed or playing Conlon Nancarrow-like glissandos (though somewhat lacking the composer’s often manic energy). These solitary organic markers of the production’s path from its inspiration in Stifter’s descriptions of the natural world become over-literal stage set props; braced on all sides, as they are, by its mechanised exoskeleton, they seem an expedient reminder that what has been witnessed has any relationship with that natural world. Heiner Goebbels, Stifter's Dinge, 2008, performance. 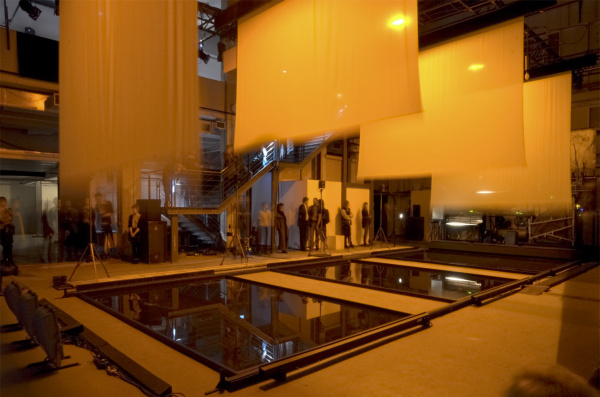 Installation view, Ambika P3, London, 2008. Photograph: Mario del Curto. Courtesy the artist and Artangel Perhaps the dominance of mechanisation in this production doesn’t lie so much in the invisibility of the puppet master pulling the strings (or in this case a group of producers and technicians overseeing a bank of laptops on a walkway above the space): it is not the visibility of the maker’s hand, but rather the tightness of its grip, and the degree to which this imbues all that it grips with an inert fatalism, making it difficult for the viewer to forget or ignore the rails along which the action runs. Once the work’s sequences have run their course (in both the Unguided Tour and the timed performance) there is no palpable sense that one has been watching a performance; no risk, no indeterminacy, and though one has been with these sounds and objects as they have moved and sounded, no sense of liveness. But is mechanical performance what, in this case, tips the balance away from a sense of liveness? The following two examples may not answer that question, but articulate this shifting point of balance. The first is an observation based on last year’s Nancarrow season at the Southbank Centre, London (21 and 22 April 2012). Characterised by dense complex rhythms and shifting time signatures that would be impossible for a human to perform at the piano, many of Nancarrow’s compositions find their form as paper rolls punched with complex patterns of holes, which are then fed through pianolas, or player-pianos – a technology that was becoming obsolete even as Nancarrow was beginning to compose for it in the late 1940s. The performance of these works, in this case a series of duets for pianola, required a surprising and consistent amount of facilitation. The two Nancarrow experts (or ‘pianolaists’, as they were described in the programme) presenting the works not only fed the punched paper rolls into the mechanics of the player-pianos, but had to very closely and physically ‘play’ the dynamic shifts in the composition as it proceeded at breakneck speed. Through this re-performance, works which when encountered as a recording can feel relentlessly mechanistic were re-framed through the agency of the two facilitators, thus returning liveness to their performance. The second case in point, and one where conversely liveness ebbs away, is software company Zenph Studios’s 2006 re-performance of Glenn Gould’s 1955 rendition of Bach’s Goldberg Variations: a twenty-first-century player-piano, programmed with the exact force with which Gould struck the keys or the weight on the pedals. Re-performed at the CBC’s Glenn Gould Studio in Toronto, the released recording contains crystal-clear stereo and binaural versions of Gould’s rendition (the 1955 recording, as well as bearing the mark of its time – a discernible hiss – is also in mono sound) but also, in this digital-mechanical resurrection, lacked what sound engineers throughout his recording career had striven to rid recordings of: Gould’s humming accompaniment to his own playing.